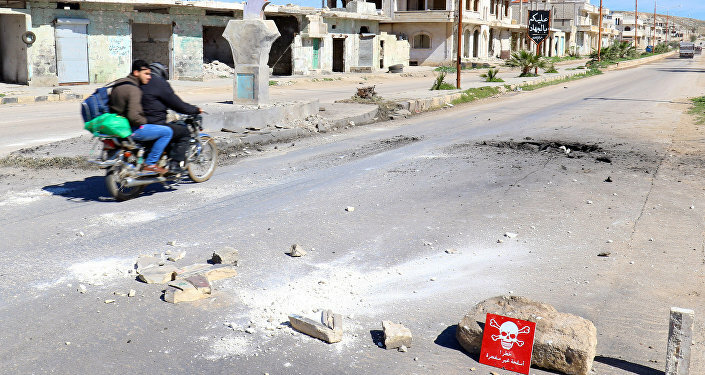 GENEVA (Sputnik) - While the Syrian authorities have managed to regain control over most of the country's territories following several years of fighting against terrorists and opposition groups, the Idlib de-escalation zone remains a stronghold of the insurgency. 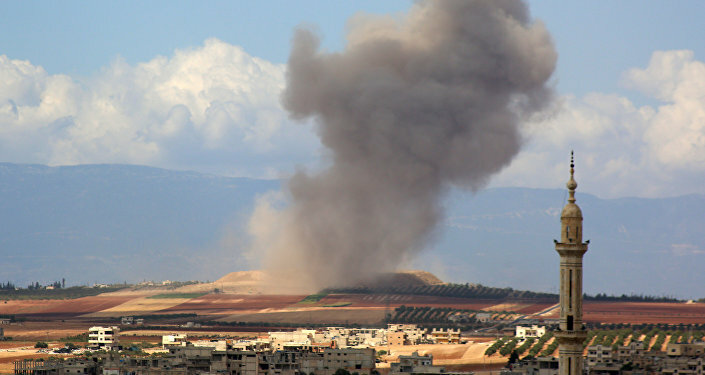 "The situation [in Idlib] is quite tense, dangerous. We would like to once again ask the international community be very careful and balanced in its assessment in case of this possible provocation, which could serve as a basis for the Western coalition to carry out new missiles strikes on Syria," Russian special presidential envoy for Syria Alexander Lavrentyev said in Geneva on Tuesday. "As you know, there were reports today that representatives of media outlets from several countries had come to Idlib area, and that the filming of fake videos showing alleged use of chemical weapons in Idlib area is ongoing, they [videos] will later be used as the proof of the Syrian government's crimes against civilians," the diplomat stressed. Possible false flag provocations with the use of chemical weapons in Syria's province of Idlib will bring much harm not only to civilians but also to the political settlement process in the war torn country, Russian Special Presidential Envoy for Syria said. "Unfortunately, it is beneficial for someone, but, as we believe, not only the civilian population will suffer. This will bring much harm to the political settlement process. We believe that the joint efforts of the international community should prevent such a scenario," Lavrentyev told reporters in Geneva. Russian special presidential envoy for Syria also said Tuesday some Western states' claims about a humanitarian disaster in Syria's Idlib are premature. "There is a lot of noise in Western media outlets about the catastrophic situation in Idlib. Some representatives of Western countries already say that this will be the biggest humanitarian disaster, and already predicting what has not happened yet. This is absolutely unacceptable," Lavrentyev told reporters. Meanwhile, Alexander Lavrentyev believes that terrorists' surrender would be the best option for solving the situation in the Idlib province, which has for years been controlled by militants and terrorist groups. "It is impossible just to imagine that the Syrian government is living in peace with the terrorists. This is absolutely unacceptable for the international community, not only for Russia, Damascus, or Iran or Turkey… If they surrender, that would be the best decision," Lavrentyev told reporters in Geneva. "When our presidents were meeting in Tehran, there was an appeal from them, and they called upon the terrorist groups to put down their weapons and to surrender, in order to prevent casualties also among civilians," Lavrentyev recalled. The delay of an anti-terrorist operation in Syria's Idlib will depend on the process of separation of moderate opposition from radicals in the province, Russian special presidential envoy for Syria stressed. "Everything will depend on to what extent the international community members could assist in the separation of moderate opposition from radicals in Idlib," Lavrentyev told a briefing in Geneva when asked to confirm whether the three guarantor states had agreed to postpone the anti-terrorist operation in Idlib at the recent summit in Tehran. The Russian envoy added that the Nusra Front terrorist organization and other militant groups related to it were covering as civilians. "One should act very carefully here, I think that troops of the three countries will be able to agree on a scheme and mechanism of the operation against terrorist organizations in the province," Lavrentyev stressed. "The most important thing is to prevent civilian casualties and suffering from the fighting," he noted. Russia, Turkey and Iran, the guarantors of the Syrian ceasefire, discussed the situation in the Idlib province at a meeting with UN Special Envoy for Syria Staffan de Mistura, noting the maximum effort needed to avoid civilian suffering. "The situation in Idlib was discussed. It was noted that the situation was complicated, and that it is necessary to make every effort to avoid civilian suffering as a result of the fight against terrorist organizations," Lavrentyev told a briefing in Geneva. "We hope that the experience that we have from a peaceful resolution of issues related to the Syrian settlement and the functioning of de-escalation zones in Eastern Ghouta, in Homs area as well as in the southeast, will be brought to the table when resolving the situation in Idlib," the diplomat stressed. However, the guarantors of the Syrian ceasefire did not set precise dates for the next talks with UN Special Envoy for Syria Staffan de Mistura, Russian special presidential envoy for Syria added. Earlier in the day, Russia, Turkey and Iran held a quadrilateral meeting with UN Special Envoy for Syria Staffan de Mistura, during which constitutional commission and Idlib situation were reviewed. Lavrentyev said the participants of the meeting had in principle coordinated two lists of Syrian constitutional commission from the opposition and the government but they required final approval. "We did not set any special date for the next quadrilateral meeting in Geneva but stressed that the work of a technical group… on reaching an agreement on the third list should be sped up," Lavrentyev said in Geneva. The Idlib de-escalation zone in Syria is under responsibility of Turkey, which should facilitate the process of separating moderate opposition from terrorists in the area, Alexander Lavrentyev stressed. 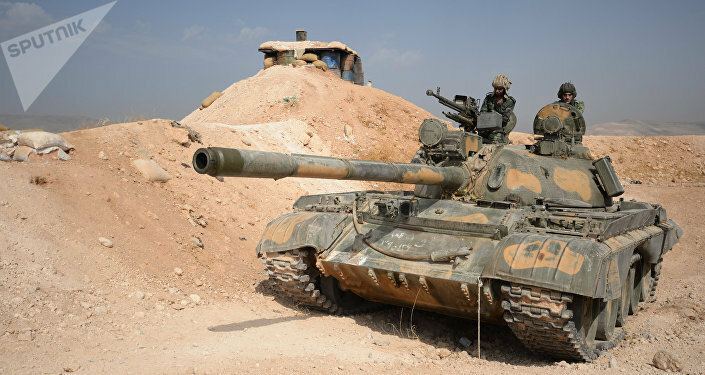 READ MORE: Is the US Preparing a Massive Military Attack Against Syria? "The Idlib province, as it was agreed 1.5 year ago, is a zone of certain responsibility of Turkey, the member of Astana process, and it's their responsibility to separate the moderate opposition from the extremists — Nusra [Front, banned in Russia] and other terrorist groups," Lavrentyev said in Geneva. "What we can see now is that despite time and despite efforts exerted by the Turkish side, still the number of those who we call extremists is quite high. It's extremely difficult for the Turks to complete their part of the job. So we want to be really helpful to them, that's why we are trying to coordinate our activities, to find a solution," the diplomat stressed. The participants of the meeting on Syria in Geneva have in principle coordinated two lists of Syrian constitutional commission from the opposition and the government, however, they will require final approval, Russian Special Presidential Envoy for Syria Alexander Lavrentyev said on Tuesday. "Indeed, in principle, I think this is a step forward, albeit a small one… we agreed on the first two lists — a list from the government and a list from the opposition. Of course, these lists will then require a final approval by representatives of the three guarantor countries and [UN Special Envoy for Syria] Staffan de Mistura, after the third list from the so-called civil society group is coordinated," Lavrentyev told reporters after a meeting at Russia's Permanent Mission to the United Nations Office in Geneva. "The work itself includes efforts on several directions and not only the formation of the constitutional commission and the formation of a list, to which a close attention was paid… Another interesting matter are procedural issues, which were discussed as well… which will then be stated in a package of measures that will promote the political process," Lavrentyev added. Lavrentiev added that Syrian truce guarantors might gather again in Geneva within month to finalize agreements on the Syria constitutional commission. Russia, Turkey and Iran have decided to create a working group to speed up forming list of civil society candidates for the Syrian constitutional commission, Russian Special Presidential Envoy for Syria said on Tuesday. "Guided by the instructions of our leaders to speed up the process of forming a commission, we adopted a consolidated decision that we need to speed up this process. In order to achieve his, we have decided to create a technical expert group that will deal with all these issues, agreeing on specific names, surnames that would be acceptable to both the government and the opposition. We believe it is very important to maintain a balance of interests," Lavrentyev told reporters after a meeting at Russia's Permanent Mission to the United Nations Office in Geneva. Moreover, the Syrian government is ready to contribute to the creation of the Syrian constitutional commission and even to create a small group which will be dealing with drafting a new constitution or amending the existing one, Russian special presidential envoy for Syria Alexander Lavrentyev said on Tuesday. "The Syrian government expresses its readiness to contribute in every way to the formation of the constitutional committee and launching of its productive work. They are ready to go further, to work on creating a narrow group that will be directly involved in the preparation of a new constitution or amending the current constitution," Lavrentyev told reporters. According to Lavrentyev, Russia will continue very active consultations with Turkish and Iranian colleagues, who have direct influence on both Damascus and the opposition. "It is very important for the commission to operate successfully so that it could bring real results. And we believe that this commission should serve the interests of the Syrian people and not to operate just for the show," Lavrentyev added. Moscow considers that a representative from the Syrian government bloc should head the future constitutional commission, Russian special presidential envoy for Syria said. "It is too early to talk about procedural matters. Our position with regard to the chairman of the constitutional commission remains the same. It should be headed by a representative from the government bloc in the constitutional commission, because the Syrian government is the legal representative of the country to the United Nations, and it is the Syrian government that should lead the process of the constitutional commission. Are there any other options? They are probably possible, but again, this is the subject for a further, very detailed discussion," Lavrentyev told reporters after talks in Geneva. Lavrentyev added that the future commission will have a narrow committee of 45 persons, who will be drafting the new constitution and preparing amendments. "This narrow committee will be formed on the same principles used in the formation of the constitutional commission of 150 people — one third will be presented by the government, another third will be presented by the opposition, and one more third by representatives of civil society. What are the principles of selection of representatives of civil society? Again, this will be within the same framework that we have formed for a general constitutional commission of 150 people," Lavrentyev said. The population of the Syrian Idlib province is not fully opposition-minded and many local civilians would express the desire to reach reconciliation with the authorities in Damascus, Russian special presidential envoy for Syria said Tuesday. "The reconciliation experience in other de-escalation zones will be very useful in Idlib, because 3.5 million civilians living there are not fully opposition-minded. The majority of them are currently simply afraid of expressing their point of view. I think that there will be many people, including representatives of the moderate opposition, who will decide for themselves on whether to reach reconciliation with the current authorities," Lavrentyev told reporters. Meanwhile, the Russian Center for Syrian Reconciliation said earlier in the day that the filming of a staged provocation with the alleged use of chemical weapons had begun in Idlib.